Completely automated conclusion of transactions of customers to interbank. Minimal lot = 0.01 usd. 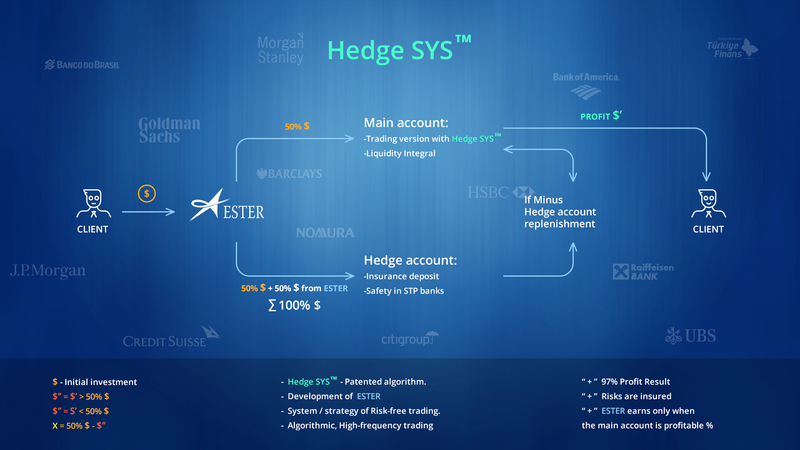 10+ Banks liquidity for Ester Holdings provide more than 10 of the world’s leading banks – market makers, including Barclays, Citibank, Credit Swiss, Commerzbank, GS, HSBC Bank, J.P. Morgan, Morgan Stanley, UBS Bank, Nomura Bank и Lucid Markets. High speed of execution of transactions, including at large volumes. Anonymity of requests to liquidity providers: they do not know where the limit and stop orders of customers are located and can not affect their execution. No restrictions on trading strategies: comfortable trading on news (due to fixed spread – no expansion). The possibility of using any automatic trading advisors. The spread is from 0 pt. Limit and stop levels = 0. End to end automate the output of transactions to the vendor. 200+ top-tier financial institutions (Bank of America, Banco do Basil, Citigroup Inc, Mizuho Financial Group, NBAD, Raiffeisen Bank, Türkiye Finans, UBS, Wells Fargo). The newest server technologies have the highest performance and allow customers to enter transactions with high speed and minimal delays.